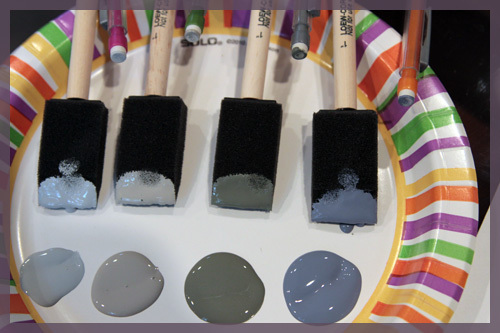 I decided to stick with the color scheme of our house… various grays/greiges/blues. 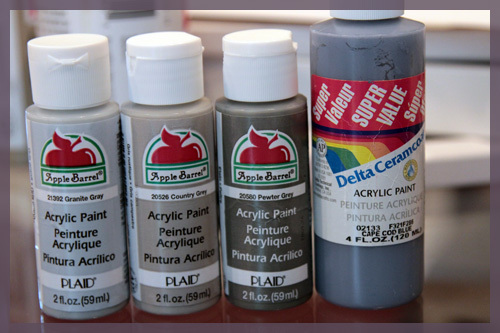 I picked up a couple of extra bottles of 89 cent craft paint just to make my life easier. I basically bought all of the shades of gray they make and I already had the blue. The rest of my materials were 100% free! I used some cardstock I already had, pencils that were laying around and a frame I already purchased. To get the monogram, I printed out our last initial, an S, in a very fancy font called… Times New Roman. I printed it in bold to give me thicker lines to follow. I eyeballed the size in print preview and figured it would look decent on a 5×7 piece of paper. 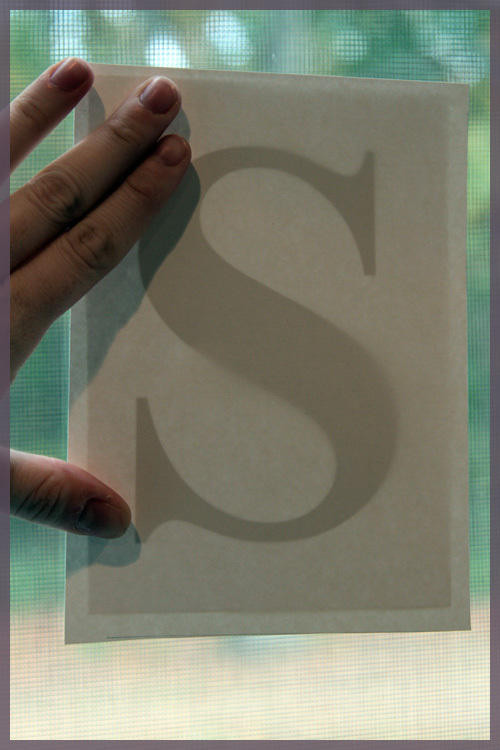 I then traced my printed S onto my cardstock by holding it up against my sliding glass door. I traced it ever so lightly, then also erased what I had just traced. Sounds crazy, but it left me with the most faint line ever so that it wouldn’t be noticeable under the paint but I could still follow it. I did some test dabs on a piece of scrap paper before starting. 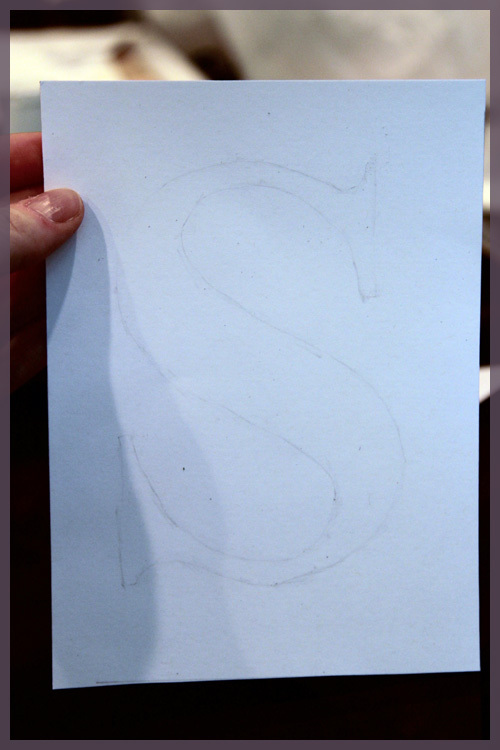 Then I just followed the lines and alternated colors along my S and tada! All done! It took me about an hour or so, which was honestly longer than expected, but well worth it. 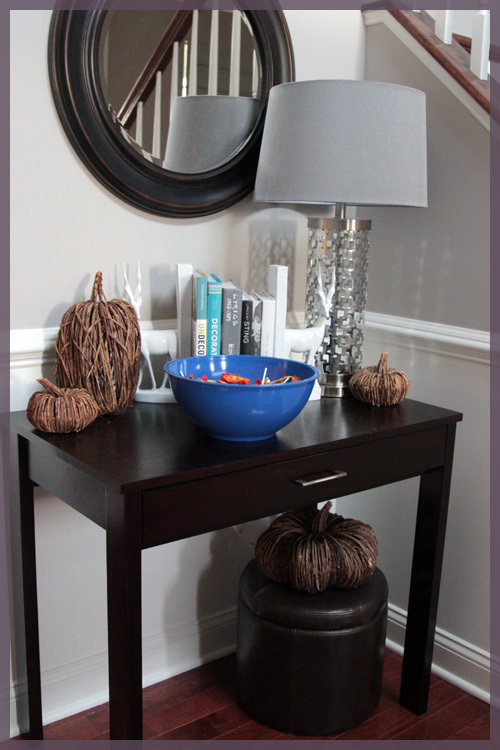 I had to decide where to put my new work of art so I decided on the entryway table, which was filled with pumpkins and Halloween candy today. The candy will be leaving tonight, so I just put my art in a matted frame and leaned my frame over by one of my beloved deer bookends. Ps- I’ve been searching for a white lampshade to replace that gray one for months. I strangely love that the mat that came with the frame is a little off-white. 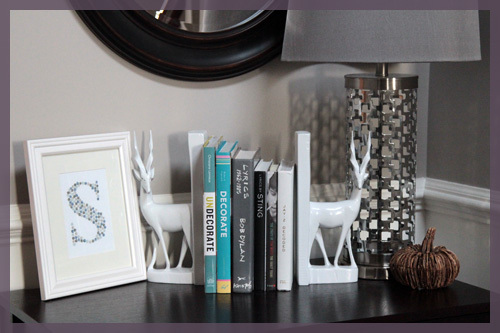 Since the chair rail, deer and cardstock are bright white, it mixes it up a bit. Maybe even a fun colored mat will look good until I hang it? Ooooo, I like it a lot!! Want to make a second and send it my way?…now that you have practice and all. It looks awesome! I never would’ve thought of using pencil erasers as stamps. Make sure to link up tomorrow! Wow I really like this! 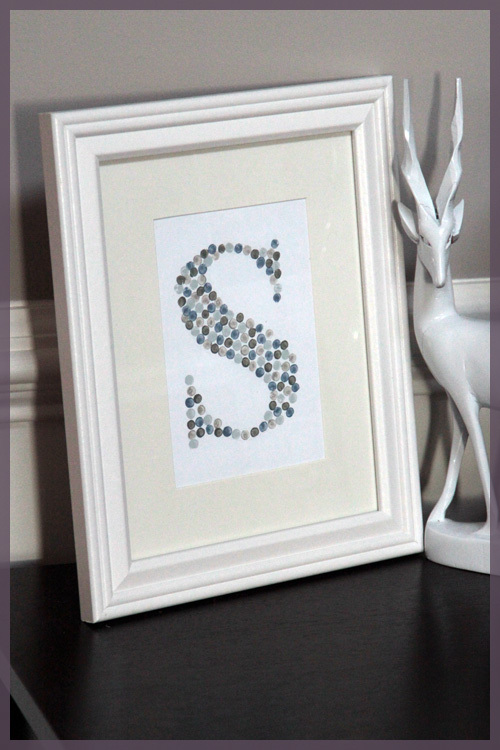 I love the colors you used for your monogram! It turned out very pretty. Love it! We love us some S’s in this house too. 🙂 Now you’ve got me thinking of all sorts of fun stuff you can do with this…! So cute! Was it hard to stay inside the lines? love this! you can’t go wrong with a monogram and i love how you used the eraser as a stamp. Love it, simple but really effective! Very cool! This looks great and I love how you used the brushes with paint on them as your ink pad. Very clever. Have you considered spray painting your lamp shade white? I saw your link on YHL and had to stop by! Oh my! My heartbeat started racing when I read this. You see, I am on the brink of being an English teacher, so erasers are right up my alley, I am OBSESSED with polka dots, and my husband’s first name, my first name, and our last name all start with S. I think the stars aligned when I saw your post, haha! I am in love with this! 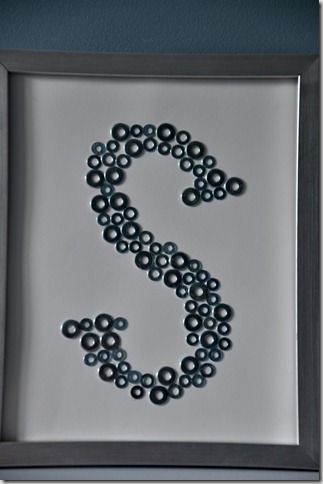 We have our S in multiple places throughout our apartment, and I’m determined to add even more because I love it! I may borrow this project and add it to our gallery wall. Thanks for the inspiration (it’s funny how we all get inspired on Pinterest and then inspire others)! I am obsessed! With the colors you chose for the stamps……….omg. Lurve it! I have to say that I think I like yours better than the washer one on pinterest! Cute stuff! how lovely! i’m gonna totally try this! Super idea! I’m thinking there may be an easy method of getting your letter outline. There is an option in the Word program to chose “outline” letters which could then be printed in a very light gray directly on your cardstock. This process not only uses less steps, it saves using all the black ink from your printer. I love your pinterest project and I also love the colours you have chosen for your divine home! 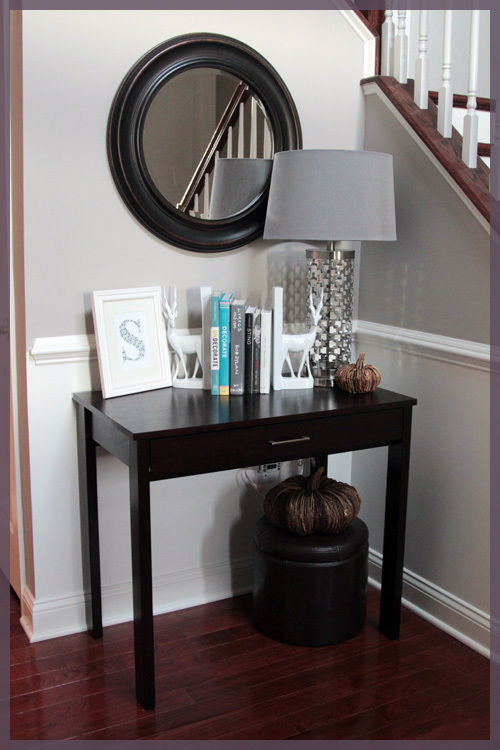 Your entryway table looks so beautiful. I have posted about a yummy salad recipe that I had pinned so if you have 5 Minutes to spare please pop by! I would be honoured if you could also link up your post to my weekly Pinterest Linky Party as this post is just fabulous! I have also created a Pinning Bloggers Master List at my blog that you might be interested in joining. I love this! Such a fantastic take on the monogrammed art! Found you through the Pinterest Challenge link up; I love this! You mentioned changing your lampshade…is it fabric? 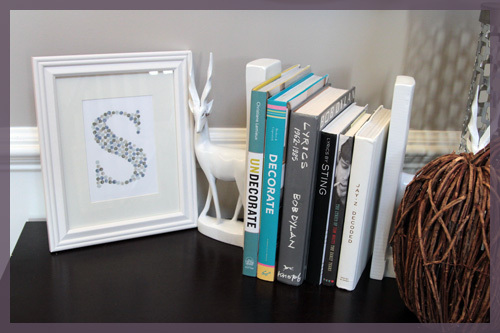 If it is, what about stenciling a geometric pattern using white (or a lighter gray) fabric paint? Tone on tone is in now, right? =D Great job! LOVE! 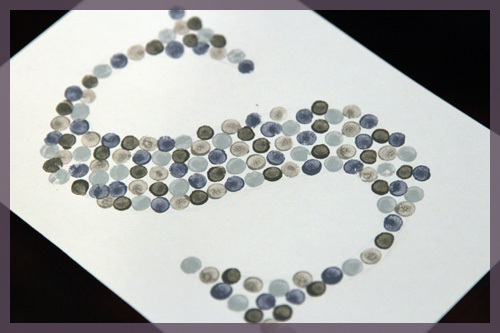 I can’t wait to try this – it’s such a cute new take on the monogram idea. Well done! Your art turned out really great. You managed to keep it so neat!. The eraser art pin was one of my inspiration images too!! absolutely LOVE your results! Such a fun twist on those two bits of inspiration! 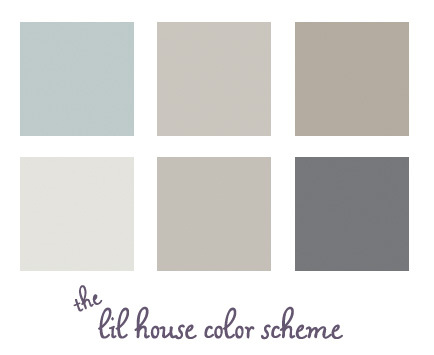 🙂 And… you now officially have a whole-house-color inspiration piece!!! I pinned that exact same photo and have tried to use the idea on a couple of different things but nothing has turned out well enough to be displayed. I love your monogram! LOVE this!! I just pinned it so I wouldn’t forget to make it! 🙂 Thanks so much for sharing!! I love this!!! I’m gonne have to pin this LOL! Just found your blog through the pinterest challenge link up… love the monogram you did. So cute! That looks great! I’m a little surprised that it took an hour though. You must be a very careful pencil stamper. Yes I was being neurotic 🙂 I was constantly alternating colors as well and trying to think ahead to the next row! I love this! That is fantastic! Can you make me one?!!!!!! I can’t believe how great it turned out! 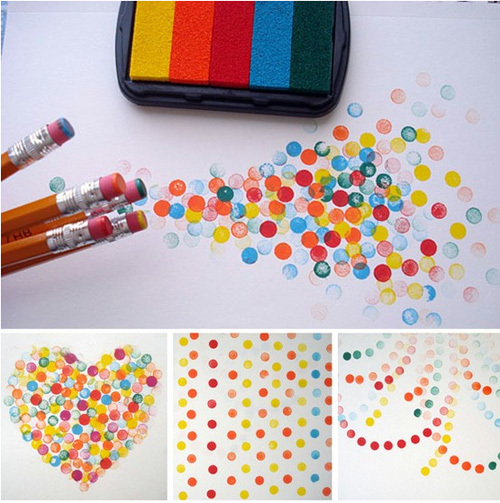 The colours, the shape, the dots… everything! I love this! Will def be trying it out soon! 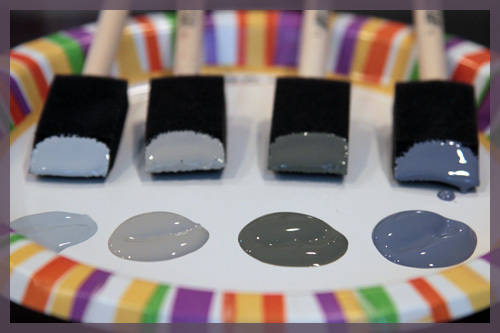 Love the colors of greys, greiges and blue chips – what are the actual paint colors and by who? Reading Scrap Cars is an established and experienced company which is qualified to offer you a free service for scrapping your old cars. We are fully certified to carry out the process for you including the processing of your DVLA paperwork. Covering Reading, Berkshire and surrounding areas. We want to make the process of selling your scrap or unwanted car as quick, easy and headache free as possible. Scrap cars can be damaging to the planet if not handled correctly. We are fully licensed by the Environment Agency, Scottish Environment Protection Agency or Natural Resources Wales and covered by the latest regulations. As dismantlers we will recycle every scrap car that comes to us correctly by removing all harmful fluids. Up to 95% of the scrap car will be shredded and reused to avoid damaging the environment through landfill. Hi there,I check your new stuff named “A Combination of Inspiration | the lil house that could” like every week.Your story-telling style is witty, keep up the good work! And you can look our website about proxy list.